Luke came home from the hospital on Sunday after getting his pacemaker installed and some of his good friends came over to wish him a warm welcome home. Luke had a pretty tough week recovering from the procedure, but appears to be doing much better this weekend and is ready to start going back to school on Monday. Thanks again for everyone's prayers!! 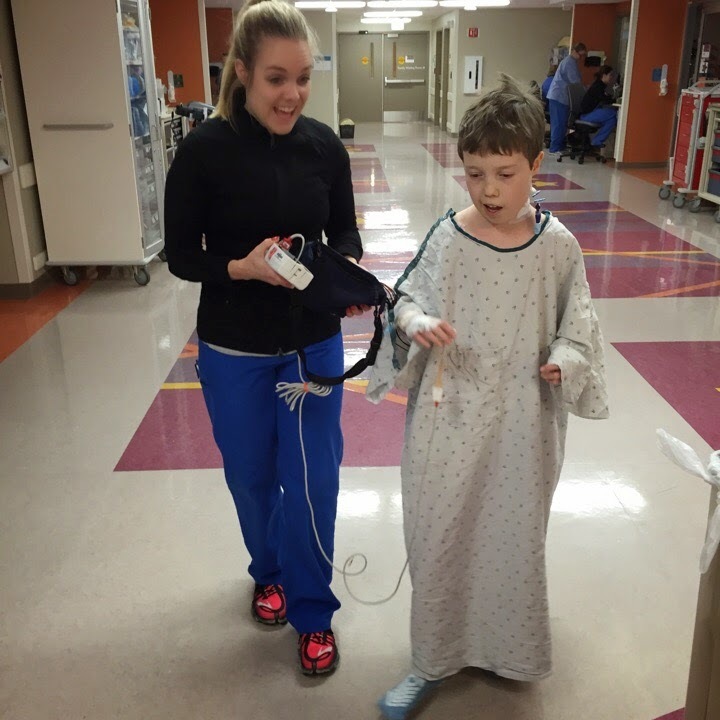 Luke was excited to go in to the doctor on Friday and see the first XRay of his new pacemaker. It kind of looks like a computer mouse to me. I really can't wait for his scar to start feeling better so I can go up and double click it whenever I want him to start paying better attention to me. On Friday, I went to Buca with some of my co-workers. This is starting to become a regular event for us to go to lunch together which is really nice for me. I just hope I can keep figuring out where they are going to lunch on Fridays so I can "just happen to be eating there at the same time also." On Friday night, we went out with one of my old- co-workers, Sean, and his lovely wife, Anne. Lucky for us, we saw them walking into the restaurant while driving by so we could go in there and "just happen to be eating there at the same time also." On Saturday, we spent much of the day visiting our friends working at the Minnesota FTC Robotics State Tournament. Our high school had three teams that qualified for state and were also hosting the tournament for the 48 teams in attendance. Unfortunately, none of our teams advanced to the next rounds of competition. The FTC challenge is geared for smaller robots with smaller teams than the larger FRC robots. The Prior Lake high school team, KING TeC, will be competing in the tournaments for the big robots which begin next week. We look forward to going to root on those robots as well. Avery volunteered for the tournament from 7am until 9pm. That's a long day wandering the hallways! Luke wasn't quite ready to come back for volunteer duty, but was excited to be able to come to the tournament for a couple of hours to cheer for his friends. I was amazed to see how cheerful he looked in this picture. Before the tournament began, some of the key figures for KING TeC gave an award to Eric Rodine. He has been the Prior Lake athletic director since the team was founded and has been extremely supportive of helping the team have a place to practice, perform, and host tournaments like this. Mr. Rodine is going to Senegal which certainly sounds a lot warmer than Minnesota. I may see if there's anything I can do to go with him. I swear to you, I have a shirt just like this. I just gotta remember to wear it one of these days.